Here are the instructions I promised you all for making a dimensional five-pointed star. I made a cardboard base that was then covered with vintage book pages, but you can make this from pretty card stock and not cover it. Just perfect your pattern first, and use a clear drying glue, if you're doing it that way. To make the dimensional star, you first need to create your pattern. For this one, I made the pattern using the 'Betsy Ross' one cut method of paper folding and snipping. You could also do this using a purchased star template, or by using geometry. Start with a sheet of paper, and fold it in half. Open the last two folds, so that your large sheet is only folded in half one time. Hold the paper in front of you with the fold at the top. Begin bringing the top left corner (corner A) across, diagonally toward the horizontal crease in the middle of your folded in half sheet. Fold from the upper point of the vertical crease in the center of your folded in half sheet. Corner A should end up about a half inch from the right side of the sheet. Line up the corner right on that crease line. Now, fold corner A back on itself, as shown here. Take the right side (B) of the sheet, and fold it over, creasing right at the fold you just made in the step above. Your sheet should look like this. Now, fold corner B back over itself, lining up the top edge with the fold on the right, as shown. Now for the scary part. Beginning at corner B, cut diagonally across, through all layers. The triangle shaped piece on the right is your star! Open it up. It should be practically perfect! Re-crease every other fold, so that it stands proud, like this. The base should sit pretty flush on the surface. Are you happy with the size and basic proportions? I decided to trim this one down a tad, to give it less chunky dimensions. Just refold the star and take off a sliver at a time, until you like the result. Here is the trimmed down version. This will be the pattern for the top of the dimensional star. To create the pattern for the base set the top pattern piece down on a sheet of paper (don't flatten it out) and trace around it, very generously (this piece will be bigger than the finished base). Before removing the top pattern piece, mark some reference points. This star cutting method is only practically perfect -- it's not precisely perfect. Cut out the base (back) pattern piece. Be generous and cut slightly outside the lines. Now you have two pattern pieces. One for the base/back, and one for the dimensional front. The pieces should be labeled and have reference marks. 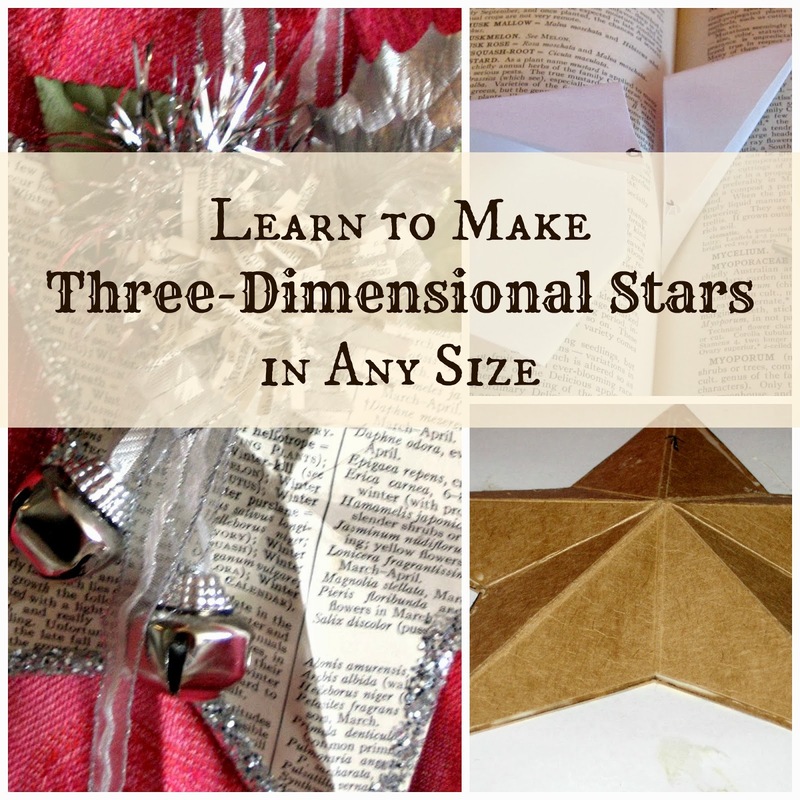 If you plan to make a lot of stars, adhere these pieces to some cardboard and cut around them. Cardboard templates will hold up to repeat use a lot better than flimsy paper. Trace around the pattern pieces onto some cardboard. This is a great way to reuse an old cereal box! Don't forget to transfer your reference points (lightly, using pencil, if you will not be covering your cardboard star base with paper). Using a bone folder (or a dead pen, or something) and a straight edge, score crease lines for the front of the star. You should make five scores, each running crotch to tip. Carefully bend at the score lines, alternating direction at the center of the star, so that you end up with this. Glue the dimensional front to the flat back piece. Here I used wood glue, because it works incredibly well on cardboard, and will *never* come apart. It dries ugly, though, so if you are not planning to cover the cardboard star with paper or paint use a clear drying glue (good old school glue works fine-- we use it for architectural models a lot)! Remember how we cut out the base piece generously? Now you can trim it flush with the front piece. To cover the star, trace around the pattern piece using your desired paper. Use pencil (or be more clever than I was, and flip the pattern over, and trace on the back of the paper). Here I used a page from a vintage book. Cut out your paper, leaving a generous quarter inch border. "Precrease" your paper, and adhere it to the cardboard. I used a wet adhesive (very thinly and evenly spread), for it's increased workability, but you could use a spray if you are confident enough. Turn the star over and clip the paper at the crotches. Trim the excess paper from the points. Wrap the paper around and glue it down. Let dry. Lay your star on top of another sheet of your decorative paper, or vintage book page. Lightly trace around it using pencil. Mark some light reference points. Cut out and adhere to back of star. Now, decorate it or leave it plain. Trim it out in jute twine, or sprinkle it with glitter. Add ribbons and bells, or "antique" the piece. Just be sure to have fun! 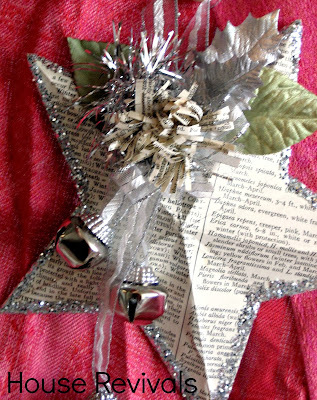 You could make a giant star using newspaper to create your pattern pieces. Or make tiny patterns using paper from a little notepad. I hope you will feel inspired to try your hand at this. Watch for the tutorial for making this woven star. If you are not a follower already, click "follow" in my side bar, so you're sure not to miss it! 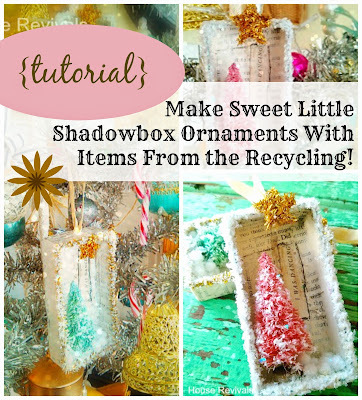 You might also like this post about making sweet shadowbox ornaments. Love mixed media? You might like this post on how to make mixed media flowers. 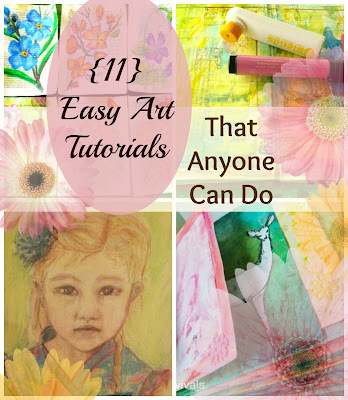 Or click here for several easy art tutorials. Oh wow! I love the star and the tutorial. I've never known how to do it and now I WILL try it! Your ornament is awesome! How pretty. I've see stars at the store but never thought about trying to make my own. I especially like how you embellished your star. That I can copy on a store bought star even if I get too busy to mkae my own this year. Thanks for the tips! What beautiful ornaments. I'm visiting from It's So Very Cheri. Have a wonderful weekend. Visiting from So Very Cheri. What a great tutorial! I am definitely going to try to make a star like this for the top of my tree. I'll just have to figure out how to include a base for it. I am following now. Must find out how to make that woven star. These would make excellent Christmas presents! Thanks for a fab tutorial ! Love this post. Although I must admit that the start ornament looks like it must have taken forever -- or perhaps it would just take ME forever, though I am going to try it. I am going to sign up to follow you, and would love for you to visit my blog and do likewise. The five-pointed version looks wonderful. Can't wait to see the woven star. Thanks for the great tutorial. Just lovely, it looks wonderful! I love how these turned out...and such a great and detailed tutorial!!! Wow, that is brilliant! I love this idea and your instructions were excellent. Thank you! I assumed you'd bought the cardboard star but you MADE it!! Wow! And thank you sooo much for sharing. This definitely on my to-do list for Christmas. I want these everywhere!!! I wouldn't have believed it if I hadn't seen it - Incredible! You almost lost me when you said 'geometry'. Ugh, the memory alone of that class upsets my tummy. Great tutorial! Thanks so much for sharing. And thanks for dropping by the other day. OMG..those are beautiful..thanks for sharing them. Love your star and thanks for the easy to follow tutrial. I hit the follow button. Eager awaiting your tutorial on the woven star. Beautiful work. You have a gift for sure! LOVE this! I love a great project that involves the use of a book! your star is beautiful, and the explanations are perfect. It is great that the base is a cereal box. I am planning on making at least one! Love this idea and I am totally going to try it. Thanks for the great tutorial. Took me a couple of tries to get the folds right, but once I did, easy peasy! These are so cool and would make awesome ornaments or just decorations! Thanks so much for stopping by the Free for All party! This is just beautiful and your instructions are very good. I would love to make one of these lovely stars! Thanks for posting! Hopped over from Boardwalk Bragfest~ love your project~ thanks for the tutorial! I am an new follower! LOVE this project! Thank you for sharing it on the Boardwalk Bragfest! I want to do one!!! Beautiful stars and great tutorial! You tired me out with all of that folding. The end result is just beautiful :). I'm gonna try to make this ! I can't wait to share this with my eleven year old son. He love origami and he will be tickled to try this, as will I.